The Laws of ASEAN-Chess cover over-the-board play. The English text is the authentic version of the Laws of ASEAN-Chess, which was adopted at the ASEAN-Chess Council at Bangkok, Thailand on March 14, 2011 coming into force on the same date. These were amended on November 26th, 2011. The Laws of ASEAN-Chess cannot cover all possible situations that may arise during a game, nor can they regulate all administrative questions. Where cases are not precisely regulated by an Article of the Laws, it should be possible to reach a correct decision by studying analogous situations, which are discussed in the Laws. The Laws assume that arbiters have the necessary competence, sound judgement and absolute objectivity. Too detailed a rule might deprive the arbiter of his freedom of judgement and thus prevent him from finding the solution to a problem dictated by fairness, logic and special factors. ASEAN Chess Confederation appeals to all chess players and federations to accept this view. c. are not valid for any ASEAN match, championship or qualifying event..etc. In case of any dispute or problems arising during a game, the chief arbiter shall make the final decision according to the FIDE Laws of Chess. 1.1 The game of ASEAN-Chess is played between two opponents who move their pieces alternately on a square board called a ‘chessboard’. 1.2 The player with the white pieces commences the game. 1.3 A player is said to ‘have the move’, when his opponent’s move has been ‘made’. 1.4 The objective of each player is to place the opponent’s king ‘under attack’ in such a way that the opponent has no legal move. The player who achieves this goal is said to have ‘checkmated’ the opponent’s king and to have won the game. 1.5 Leaving one’s own king under attack, exposing one’s own king to attack and also ‘capturing’ the opponent’s king are not allowed. 1.6 The player whose king has been checkmated has lost the game. 1.7 If the position is such that neither player can possibly checkmate, the game is drawn. The chessboard is composed of an 8×8 grid of 64 equal squares alternately light (the ‘white’ squares) and dark (the ‘black’ squares). 2.3.2 The eight vertical columns of squares are called ‘files’. The eight horizontal rows of squares are called ‘ranks’. A straight line of squares touching corner to corner is called a ‘diagonal’. 3.2 If a piece moves to a square occupied by an opponent’s piece the latter is captured and removed from the chessboard as part of the same move. A piece is said to attack an opponent’s piece if the piece could make a capture on that square according to Articles 3.4 to 3.9. 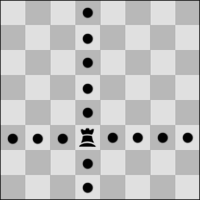 3.3 A piece is considered to attack a square, even if such a piece is constrained from moving to that square because it would then leave or place the king of its own colour under attack. 3.4 The queen may move to adjoining diagonal square. It means that the most squares to choose for moving the queen is only four. 3.5 The rook may move to any square along the file or the rank on which it stands. 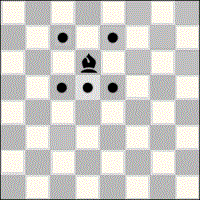 3.6 The bishop may move to any adjoining diagonal squares and front square. It means that the most squares to choose for moving the bishop is only five. 3.7 When making these moves, the general, rook or bishop may not move over any intervening pieces. 3.8 The knight may move to one of the squares nearest to that on which it stands but not on the same rank, file or diagonal. b. the pawn may move to a square occupied by an opponent’s piece, which is diagonally in front of it on an adjacent file, capturing that piece. c.1 When a pawn reaches the rank furthest from its starting position, it must be exchanged as part of the same move for a new for a new queen, rook, bishop or knight of the same colour. The player’s choice is not restricted to pieces that have been captured previously. This exchange of a pawn for another piece is called ‘promotion’ and the effect of the new piece is immediate. 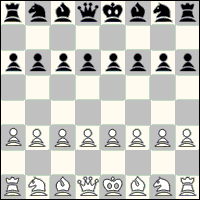 3.10 The king can move to any adjoining square not attacked by one or more of the opponent’s pieces. 3.11 The king is said to be ‘in check’ if it is attacked by one or more of the opponent’s pieces, even if such pieces are constrained from moving to that square because they would then leave or place their own king in check. No piece can be moved that will either expose the king of the same colour to check or leave that king in check. 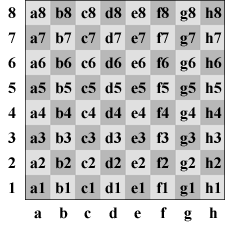 b. in the case of the promotion of a pawn, when the pawn has been removed from the chessboard and the player’s hand has released the new piece after placing it on the promotion square. 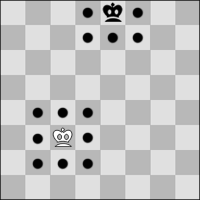 If the player has released from his hand the pawn that has reached the promotion square, the move is not yet made, but the player no longer has the right to play the pawn to another square. 4.4 A player forfeits his right to a claim against his opponent’s violation of Article 4.3 once he deliberately touches a piece. 5.1 a. The game is won by the player who has checkmated his opponent’s king. This immediately ends the game, provided that the move producing the checkmate position was a legal move. b. The game is won by the player whose opponent declares he resigns. This immediately ends the game. 5.2 a. The game is drawn when the player to move has no legal move and his king is not in check. The game is said to end in ‘stalemate’. This immediately ends the game, provided that the move producing the stalemate position was legal. 6.1 ‘Chess clock’ means a clock with two time displays, connected to each other in such a way that only one of them can run at one time. 6.2 a. When using a chess clock, each player must make a minimum number of moves or all moves in an allotted period of time and/or may be allocated an additional amount of time with each move. All these must be specified in advance. b. The time saved by a player during one period is added to his time available for the next period, except in the ‘time delay’ mode. 6.3 Each time display has a ‘flag’. Immediately after a flag falls, the requirements of Article 6.2(a) must be checked. 6.6 If neither player is present initially, the player who has the white pieces shall lose all the time that elapses until he arrives; unless the rules of the competition specify or the arbiter decides otherwise.. The time between making the move on the chessboard and stopping his own clock and starting his opponent’s clock is regarded as part of the time allotted to the player. b. A player must stop his clock with the same hand as that with which he made his move. It is forbidden for a player to keep his finger on the button or to ‘hover’ over it. c. The players must handle the chess clock properly. It is forbidden to punch it forcibly, to pick it up or to knock it over. Improper clock handling shall be penalised in accordance with Article 13.4.
d. If a player is unable to use the clock, an assistant, who is acceptable to the arbiter, may be provided by the player to perform this operation. His clock shall be adjusted by the arbiter in an equitable way. 6.10 Except where Articles 5.1 or one of the Articles 5.2 (a), (b) and (c) apply, if a player does not complete the prescribed number of moves in the allotted time, the game is lost by the player. However, the game is drawn, if the position is such that the opponent cannot checkmate the player by any possible series of legal moves, even with the most unskilled counter-play. a. the game shall continue if it happens in any period of the game except the last period. b. the game is drawn in case it happens in the period of a game, in which all remaining moves must be completed. 6.13 a. If the game needs to be interrupted, the arbiter shall stop the clocks. b. A player may stop the clocks only in order to seek the arbiter’s assistance, for instance when promotion has taken place and the piece required is not available. d. If a player stops the clocks in order to seek the arbiter’s assistance, the arbiter shall determine if the player had any valid reason for doing so. If it is obvious that the player has no valid reason for stopping the clocks, the player shall be penalised. 6.14 If an irregularity occurs and/or the pieces have to be restored to a previous position, the arbiter shall use his best judgement to determine the times to be shown on the clocks. He shall also, if necessary, adjust the clock’s move counter. b. If during a game it is found that the only error is that the chessboard has been placed contrary to Article 2.1, the game continues but the position reached must be transferred to a correctly placed chessboard. 7.2 If a game has begun with colours reversed, then it shall continue, unless the arbiter rules otherwise. 7.4 a. If during a game it is found that an illegal move, including promotion of a pawn or capturing the opponent’s king, has been completed, the position immediately before the irregularity shall be reinstated. If the position immediately before the irregularity cannot be determined, the game shall continue from the last identifiable position prior to the irregularity. The clocks shall be adjusted according to Article 6.14. Article 4.3 applies to the move replacing the illegal move. The game shall then continue from this reinstated position. b. After the action taken under Article 7.4(a), for the first two illegal moves by a player the arbiter shall give two minutes extra time to his opponent in each instance; for a third illegal move by the same player, the arbiter shall declare the game lost by this player. 7.5 If during a game it is found that pieces have been displaced from their squares, the position before the irregularity shall be reinstated. If the position immediately before the irregularity cannot be determined, the game shall continue from the last identifiable position prior to the irregularity. The clocks shall be adjusted according to Article 6.14. The game shall then continue from this re-instated position. 8.1 In the course of play each player is required to record his own moves and those of his opponent in the correct manner, move after move, as clearly and legibly as possible, in the algebraic notation (Appendix E), on the ‘scoresheet’ prescribed for the competition. It is forbidden to write the moves in advance. If a player has less than five minutes left on his clock and has additional time of 30 seconds or more added with each move, both players have to write the opponent’s before completing their own move. 8.5 a. If neither player is required to keep score under Article 8.4, the arbiter or an assistant should try to be present and keep score. In this case, immediately after one flag has fallen, the arbiter shall stop the clocks. Then both players shall update their scoresheets, using the arbiter’s or the opponent’s scoresheet. 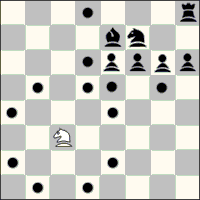 c. If no complete scoresheet is available, the players must reconstruct the game on a second chessboard under the control of the arbiter or an assistant. He shall first record the actual game position, clock times and the number of moves made, if this information is available, before reconstruction takes place. 8.6 If the scoresheets cannot be brought up to date showing that a player has overstepped the allotted time, the next move made shall be considered as the first of the following time period, unless there is evidence that more moves have been made. 9.1 a. A player wishing to offer a draw shall do so after having made a move on the chessboard and before stopping his clock and starting the opponent’s clock. An offer at any other time during play is still valid. No conditions can be attached to the offer. In both cases the offer cannot be withdrawn and remains valid until the opponent accepts it, rejects it orally, rejects it by touching a piece with the intention of moving or capturing it, or the game is concluded in some other way. b. The offer of a draw shall be noted by each player on his scoresheet with a symbol (See Appendix E13). c. A claim of a draw under 9.2 shall be considered to be an offer of a draw. b. the last 50 consecutive moves have been made by each player without the movement of any pawn and without any capture. 9.3 If the player makes a move without having claimed the draw he loses the right to claim, as in Article 9.2 on that move. 9.4 If a player claims a draw as in Article 9.2, he shall immediately stop both clocks. He is not allowed to withdraw his claim. a. If the claim is found to be correct the game is immediately drawn. b. If the claim is found to be incorrect, the arbiter shall add three minutes to the opponent’s remaining time. Additionally, if the claimant has more than two minutes on his clock the arbiter shall deduct half of the claimant’s remaining time up to a maximum of three minutes. If the claimant has more than one minute, but less than two minutes, his remaining time shall be one minute. If the claimant has less than one minute, the arbiter shall make no adjustment to the claimant’s clock. Then the game shall continue and the intended move must be made. 9.5 The game is drawn when a position is reached from which a checkmate cannot occur by any possible series of legal moves, even with the most unskilled play. This immediately ends the game, provided that the move producing this position was legal. 10. Member federations may ask ASEAN Chess Confederation to give an official decision about problems relating to the Laws of Chess. ASEAN Chess Confederation recognizes for its own tournaments and matches only one system of notation, the Algebraic System, and recommends the use of this uniform chess notation also for chess literature and periodicals. Scoresheets using a notation system other than algebraic may not be used as evidence in cases where normally the scoresheet of a player is used for that purpose. An arbiter who observes that a player is using a notation system other than the algebraic should warn the player about of this requirement. E1. In this description, “piece” means a piece other than a pawn. E3. In printed periodicals, the use of figurines for the pieces is recommended. E4 Pawns are not indicated by their first letter, but are recognised by the absence of such a letter. Examples: e5, d4, a5. E5. The eight files (from left to right for White and from right to left for Black) are indicated by the small letters, a, b, c, d, e, f, g and h, respectively. E6 The eight ranks (from bottom to top for White and from top to bottom for Black) are numbered 1, 2, 3, 4, 5, 6, 7 and 8, respectively. 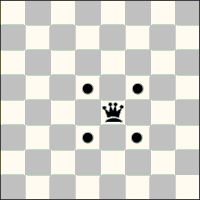 Consequently, in the initial position the white pieces and pawns are placed on the first and third ranks; the black pieces and pawns on the eighth and sixth ranks. E7 As a consequence of the previous rules, each of the sixty-four squares is invariably indicated by a unique combination of a letter and a number. E8 Each move of a piece is indicated by (a) the first letter of the name of the piece in question and (b) the square of arrival. There is no hyphen between (a) and (b). Examples: Be5, Nf3, Rd1. E9 When a piece makes a capture, an x is inserted between (a) the first letter of the name of the piece in question and (b) the square of arrival. Examples: Bxe5, Nxf3, Rxd1. 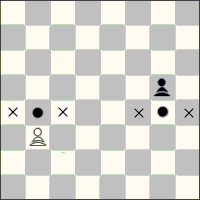 When a pawn makes a capture, the file of departure must be indicated, then an x, then the square of arrival. Examples: dxe5, gxf3, axb5. 1. If both pieces are on the same rank: by (a) the first letter of the name of the piece, (b) the file of the square of departure, and (c) the square of arrival. 2. If both pieces are on the same file: by (a) the first letter of the name of the piece, (b) the rank of the square of departure, and (c) the square of arrival. If the pieces are on different ranks and files, method (1) is preferred. In the case of capture, an x must be inserted between (b) and (c). E11 If two pawns can capture the same piece or pawn of the opponent, the pawn that is moved is indicated by (a) the letter of the file of departure, (b) an x, (c) the square of arrival. Example: If there are white pawns on squares c4 and e4 and a black pawn or piece on the square d5, the notation for White’s move is either cxd5 or exd5, as the case may be. E12 In the case of the promotion of a pawn, the original pawn square of the pawn is indicated, followed immediately by the square of the new piece. Examples: f7-f8(Q) or f8(Q), d7-d8(N) or d8(N), b2-b1(R) or b1(R), g2-g1(B) or g1(B). E13 The offer of a draw shall be marked as (=).